Spontaneously contracting syncytia of cardiomyocytes derived from human-induced pluripotent stem cells are useful models of human cardiac physiology and pharmacology. Here we present a high-throughput screening system to quantify the effects of exogenous compounds on beating frequency, using a Ca-sensitive fluorescent dye and a temperature-controlled imaging multi-well plate reader. Forny, C., Sube, R., Ertel, E. A. Contractions of Human-iPSC-derived Cardiomyocyte Syncytia Measured with a Ca-sensitive Fluorescent Dye in Temperature-controlled 384-well Plates. J. Vis. Exp. (140), e58290, doi:10.3791/58290 (2018). Spontaneously contracting syncytia of cardiomyocytes derived from human-induced pluripotent stem cells (hiPSC-CM) are a useful model of human cardiac physiology and pharmacology. Various methods have been proposed to record this spontaneous activity and to evaluate drug effects, but many of these methods suffer from limited throughput and/or physiological relevance. We developed a high-throughput screening system to quantify the effects of exogenous compounds on hiPSC-CM's beating frequency, using a Ca-sensitive fluorescent dye and a temperature-controlled imaging multi-well plate reader. We describe how to prepare the cell plates and the compound plates and how to run the automated assay to achieve high sensitivity and reproducibility. We also describe how to transform and analyze the fluorescence data to provide reliable measures of drug effects on spontaneous rhythm. This assay can be used in drug discovery programs to guide chemical optimization away from, or toward, compounds affecting human cardiac function. The present protocol depicts a method to measure drug effects on the spontaneous beating frequency of syncytia of hiPSC-CM at physiologically relevant rhythms. Human-induced pluripotent stem cells can differentiate into functional cardiomyocytes that establish spontaneously beating syncytia in vitro1,2,3,4. These hiPSC-CM can be obtained in large numbers through commercial providers or through production in the laboratory, and they are a useful source of cells to generate models of human cardiac physiology and pharmacology. In particular, they can be used to predict or to characterize cardiac effects that may occur when a drug is administered to humans5. The beating frequency of hiPSC-CM syncytia can be measured under physiological conditions using microelectrode arrays or impedance sensing1: these noninvasive techniques provide very detailed information on drug effects, but they are rather low-throughput and they do not enable testing large compound libraries within realistic time and budget constraints. A more effective system can be elaborated using a 384-well fluorescence imaging plate reader and a Ca-sensitive dye6, but classical plate readers are hindered by suboptimal temperature control and acquisition frequency. These limitations are illustrated by unphysiological beating rates (~15 bpm, compared to 35–55 bpm in controlled environments1) and poor Ca signal resolution (an acquisition frequency of 8 Hz is at the lower limit to record rates that can reach 120 bpm under stimulated conditions, and it cannot extract information such as slope or duration). The method described here combines the recording of beating patterns at physiological rhythms and at sufficient resolution to preclude these concerns. On the positive side, this method is simple, reliable, and high throughput, which allows the rapid testing of large numbers of compounds at reasonable costs. On the negative side, this method requires a fast plate reader with effective temperature control, which is an expensive investment, and it provides little mechanistic information on observed drug effects, which may necessitate further testing with more detailed methods. Approximatively 6 x 106 hiPSC-CM are needed for one measurement in one 384-well cell plate. hiPSC-CM are usually supplied commercially as frozen aliquots of ~4 x 106 cells in 1 mL. Therefore, it is convenient to prepare two cell plates with three frozen aliquots. In most cases, due to the low variability of this assay, it is sufficient to perform duplicate measurements of the test compounds and, in each cell plate, quadruplicate measurements of the positive controls (forskolin, N6-cyclopentyl-adenosine, and E-4031), and 20-plicate measurements of the negative control (DMSO alone). Therefore, a maximum of 352 compound/concentration pairs can be evaluated with two 384-well cell plates. The following protocol considers such an experiment performed with 352 test compounds, two cell plates, and 12 million cells supplied as three frozen aliquots; it can be easily scaled-up if additional data points are needed. NOTE: Prepare the cell plates 3–4 weeks before the measurement of drug effects. NOTE: For planning purposes, the test compound application can be performed on any day between days 22–28 of the experiment. Turn on the water bath at 37 °C and warm 40 mL of plating medium (as supplied by the manufacturer). NOTE: Use the cells with their supplier-provided matching culture and maintenance media. Thaw the hiPSC-CM by placing the cryotubes containing frozen cells in the water bath for 2 min. Transfer the 1 mL cell suspensions carefully to a 50 mL conical tube. Wash each cryotube with 1 mL of warm plating medium to retrieve the leftover cells and add the wash media to the same conical tube from step 1.1.3 containing cells. Mix carefully another 8 mL of warm plating medium into the cell suspension. Count live cells using the trypan blue exclusion method and a hematocytometer8. NOTE: The requirement of 6 x 106 cells for one 384-well cell plate considers the possibility of up to 20% dead cells among the frozen cells, which is a maximum in our experience. Adjust the cell suspension to 5 x 105 live cells/mL with the warm plating medium. Distribute the cell suspension into two 384-well cell plates by adding 25 µL to each well (about 12,500 cells per well). NOTE: The cell plates do not need to be precoated with any matrix (see Discussion). Maintain the cell plates at 37 °C in a humidified atmosphere containing 5% CO2. Turn on the water bath at 37 °C and warm 50 mL of maintenance medium supplemented with 1% v/v penicillin-streptomycin solution. Replace the plating medium with 50 µL of warm maintenance medium in each well of the cell plates. NOTE: The hiPSC-CMs do not need any passaging over this period, as they are non-dividing cells. Renew half of the maintenance medium every 2–3 days and renew it entirely on days 7, 14, and 21. NOTE: The fluorescence measurement can be performed between days 22 and 28 of the experiment. Longer durations have not been tried but may still be fine. NOTE: Prepare the instrument, compound plates, and assay plates on the day of the measurement of drug effects, between days 22 and 28 of the experiment. Use a fluorescent plate reader equipped with temperature control and an appropriate fluorescence filter kit and excitation light source. For example, use a Fluo-3/Fluo-4/Fluo-8 fluorescence filter kit (excitation: 472 nm; emission: 520–560 nm) and a 150 W excitation light source unit. At least 2 h before the first cell plate is to be placed inside the plate reader for the measurement, turn on the reader and set the heating system at 37 °C. NOTE: This can also be done the evening before. Prepare the positive controls, forskolin, N6-cyclopentyl-adenosine, and E-4031 as stock solutions of 0.33 mM in DMSO, 10 mM in DMSO, and 3.33 mM in H2O, respectively. NOTE: Stock solutions will be diluted 333-fold by the time they are added to the cells, and the aim is to achieve final test concentrations of 1 µM forskolin, 30 µM N6-cyclopentyl-adenosine, and 10 µM E-4031, which produce reliable and reproducible effects. Prepare the 352 test compounds as DMSO stock solutions at 333-fold the planned test concentrations (e.g., 10 mM for a test at 30 µM). NOTE: The aim is to achieve a final concentration of 0.3% (v/v) DMSO in the cell plate after the compound application; this is the highest DMSO concentration that does not affect the rhythmic activity of the cardiomyocytes. The stock solutions can also be prepared the day before. A minimum of 5 µL of stock solution is required for each duplicate measurement. Warm 40 mL of maintenance medium supplemented with 1% v/v penicillin-streptomycin solution to room temperature. Distribute into two 384-well compound plates by adding 1.5 µL of stock solution per well: i) the test compounds (two wells each), ii) the positive controls (forskolin, N6-cyclopentyl- adenosine, and E-4031, four wells each per compound plate), and iii) the negative control (DMSO, 20 wells per compound plate). Centrifuge the compound plates at 100 x g for 1 min. Add 37 µL of maintenance medium at room temperature to each well (3.9% DMSO in 38.5 µL at that stage). Load the compound plates into the plate reader. NOTE: The next steps should be performed as soon as possible to minimize evaporation in the compound plates. Turn on the water bath at 37 °C and warm 100 mL of maintenance medium supplemented with 1% v/v penicillin-streptomycin solution. Reconstitute the Ca-sensitive fluorescent dye and quencher with 10 mL of warm maintenance medium with antibiotics. NOTE: This stock fluorescence medium contains the Ca-sensitive fluorescent dye, usually Fluo-4, and a quencher, and any leftover can be stored at 4 °C for at least 5 days. NOTE: Perform the data acquisition on the day of the measurement of drug effects. Perform steps 3.1–.10 entirely for the first cell plate, then repeat them for the second cell plate. Start the plate reader software (if needed) and load the pipet tips. Adjust the software settings to record a 2 min segment of Calcium waves with an acquisition frequency of at least 10 Hertz to define the baseline beating rate for each well. For one cell plate, dilute 3 mL of stock fluorescence medium into 12 mL of warm maintenance medium with antibiotics to make the fluorescence medium. Replace 20 µL of medium in each well of the cell plate with 30 µL of fluorescence medium. Pipette up and down 1x to mix. Place the cell plate into the plate reader as quickly as possible to let the hiPSC-CM acclimatize to the temperature. Wait for 60 min before starting the data acquisition. Start the data acquisition in the plate reader software to record a 2 min segment of Ca waves with an acquisition frequency of at least 10 Hz, to define the baseline beating rate for each well. NOTE: For each recording sequence, make sure the cell plate is not transferred automatically out of the device after the data acquisition. This prevents the cell plate from cooling at room temperature. With some versions of plate reader software, it may be necessary to stop each recording before it ends completely to achieve this. Add the test and reference compounds with the plate reader robot by pipetting well-to-well 5 µL from the compound plate into the cell plate (after addition, the DMSO concentration is 0.3% [v/v]). Start the data acquisition in the plate reader software to record 2 min segments of Ca waves starting about 5, 15, 30, 45, and 60 min after the compound addition (make sure each time that the cell plate stays in the device). NOTE: The data analysis can be performed any time after the measurement. Export the raw data for each recording period from the plate reader software as ASCII text files. Import the raw data into the data analysis software. For each well and all time points, extract the primary beating frequency. NOTE: With the data analysis software listed in the Table of Materials, beating frequencies can be calculated with a custom analysis routine using the LombPeriodogram function, based on the Lomb–Scargle method of least-squares spectral analysis7. The periodogram should be calculated for a range of frequencies between 0.01 and 5 Hz. 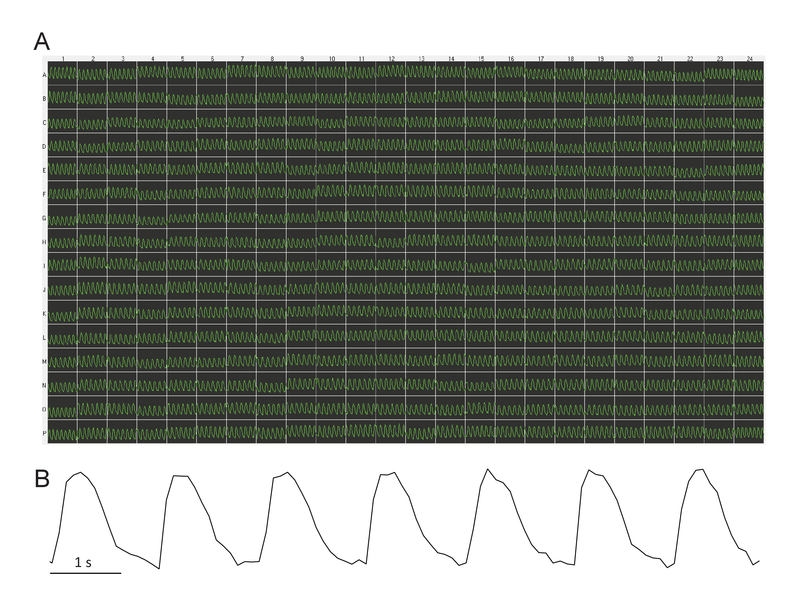 The primary frequency can be extracted from the periodogram using the PeakAutoFind routines. This analysis method provides more accurate measurements of beating frequencies than the method supplied as an option with the plate reader software. However, the latter can still be used if software customization is not an option. Export the primary beating frequencies for each recording period from the data analysis software as clipboard copies or as ASCII text files. Import the primary beating frequencies into a spreadsheet software by clipboard pasting or text file import. NOTE: Steps 4.5–4.9 can be performed in any modern spreadsheet software. For each well, normalize to baseline the beating frequency at each time point after the drug application (5, 15, 30, 45, and 60 min) by dividing the primary beating frequency at that time point by the primary beating frequency at baseline. Calculate the mean DMSO effect at each time point after the drug application (5, 15, 30, 45, and 60 min) by averaging the normalized values for the 20 wells where DMSO was applied. For each well and each time point after the drug application (5, 15, 30, 45, and 60 min), subtract the mean DMSO effect (time-matched) for the same plate. NOTE: If a compound changes frequency or the software cannot find a primary frequency after the compound addition, a visual examination of the beating pattern can evaluate whether the compound produced arrhythmias. Figure 1 shows a representative recording of Ca waves at baseline across one 384-well plate. In most cases, all wells reveal a regular beating rate with little variability across the plate (mean ± SD = 40.1 ± 3.5 bpm; range = 34–54 bpm). Very occasionally (less than 1 out of 10 experiments), a few wells (less than 5) have arrhythmia or absence of rhythm. In three 384-well plates, we have also tried cardiomyocytes from another supplier (see Table of Materials) and obtained very similar baseline values for the spontaneous beating. Blockers of cardiac ion channels affect the rhythm of the cardiomyocytes in a reproducible manner5. Amlodipine, a blocker of the slow Ca channels9, accelerates the rhythm more than 100% in a concentration-dependent manner up to 1 µM (Figure 2A). The effect is well developed within the first 5 min, but it still increases approximatively 50% within the next 30 min before it stabilizes. Above 1 µM, amlodipine arrests the beating (dashed lines), as can be expected from the fact that Ca cycling is critical to the spontaneous contractions. Other selective dihydropyridine Ca channel blockers produce very similar effects. E-4031, a blocker of the rapid delayed rectifier K channels10, decelerates the rhythm about 65–70% in a concentration-dependent manner up to 10 µM (Figure 2B). The effect develops within the first 5 min and it does not vary within the next 60 min. Other selective IKr blockers produce similar effects, although the maximal reduction in rate can vary (e.g., 35–40% for cisapride, 70% for E-4031, and 90% - 95% for dofetilide). The basis for this disparity is not known. Tetrodotoxin, a blocker of the fast Na channels11, decelerates the rhythm about 15% in a concentration-dependent manner, up to 1–30 µM (Figure 2C). The effect is well developed within the first 5 min and it does not vary much within the next 60 min. 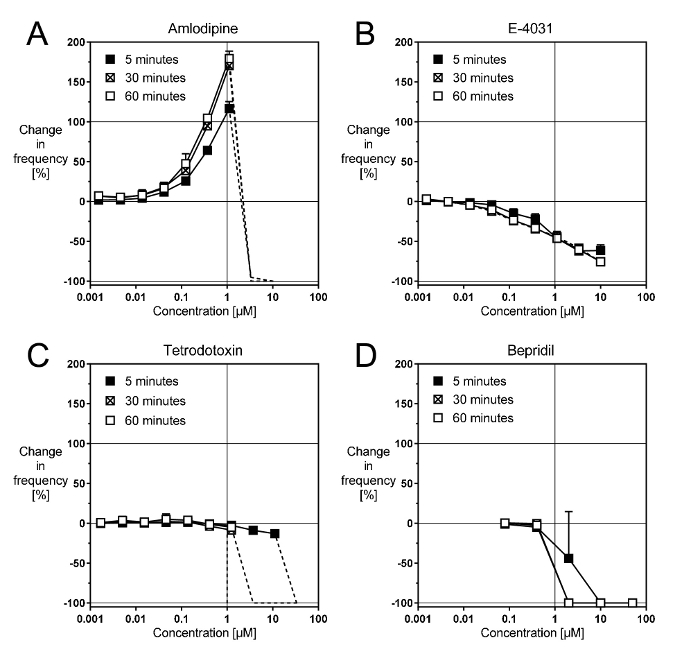 However, above 30 µM, tetrodotoxin arrests the beating within the first 5 min, whereas after 30 min, it arrests it above 1 µM. Other Na channel blockers, such as lidocaine or mexiletine, produce similar all-or-nothing effects. Bepridil, a mixed blocker of cardiac Na, Ca, and K channels9, also produces an all-or-nothing effect (Figure 2D). This suggests that in this preparation, a block of Na channels is the primary action of bepridil. An acceleration due to Ca channel block is not seen, and the more progressive slowing due to IKr block appears masked by the Na channel effect. Figure 1: Representative baseline Ca waves across a 384-well plate. (A) All wells across the plate demonstrate a regular beating rate with little variability. This image is captured directly from the plate reader software. Each trace is 10 s in duration. The fluorescence intensity is arbitrary (relative light units derived from the video camera greyscale). (B) This blow-up of one 10 s trace shows the low noise of the signal. Please click here to view a larger version of this figure. Figure 2: Representative effects of cardiac ion channel blockers. These panels show concentration-response curves with (A) the selective Ca channel blocker amlodipine, (B) the selective IKr blocker E-4031, (C) the selective Na channel blocker TTX, and (D) the non-selective channel blocker bepridil. Please click here to view a larger version of this figure. Two aspects are most critical for the successful recording of beating frequencies. The first is to exercise caution with cell plating and culture. In particular, it is important to try and avoid scratching the cell layer at the bottom of the wells when exchanging the medium. It is acceptable to touch the bottom of the wells with the pipettes, but the same angle should be used every time, thereby producing only a tiny scratch in the cell layer and not affecting the assay performance. The second critical aspect of obtaining reproducible homogeneous rhythms is to provide good temperature control at 37 °C across the cell plate for the duration of the measurement. We could not obtain this homogeneity using devices other than the plate reader used here, but it may be feasible with special modifications to the temperature regulation: it would make the protocol presented here more broadly usable beyond a single brand of plate reader. To achieve temperature stability for the duration of the experiment with the device used here, it was necessary to stop each recording before it ended; otherwise, the robot would eject the measured cell plate. This technical issue may disappear with the next release of the plate reader software, but it remains critical for now. If a cell plate is mistakenly transferred outside the plate reader, it must be loaded back inside as fast as possible. Nevertheless, the quality of the experiment will deteriorate, because temperature changes affect the beating rate extremely rapidly. Some other aspects, which have not been tested thoroughly, may be less important. For example, hiPSC-CM manufacturers recommend coating cell-culture plates before seeding the cells, but in this specific assay, coating was not used, because the cells adhere quite easily on various surfaces, and it is very difficult to properly coat 384-well plates. Yet, cell plate coating may still be allowable, or it may even improve the assay quality. We also never tested whether solvents other than DMSO would be acceptable, but it is expected from experience with other recording technologies that similar concentrations of EtOH or MeOH would also be tolerable. We generally use hiPSC-CMs from the same manufacturer, and cells from only one additional supplier were tested, which appeared to work in a similar manner. Likewise, we have used only a small number of different batches of hiPSC-CMs that were selected by prechecking them to verify that they behaved similarly to the initial batch. One or two batches were deemed inappropriate because their syncytia had poor stability or reproducibility under the culture conditions used here. Otherwise, the pharmacology appeared very similar across batches when testing a limited panel of "typical" compounds (forskolin, N6-cyclopentyl- adenosine, and E-4031, as well as endothelin, isoproterenol, amlodipine, and ponesimod). We only used hiPSC-CM derived from healthy donors. It may be worthwhile to assess whether hiPSC-CM derived from patients with heart disease would provide different results, although no difference between healthy donors and patients was observed when evaluating the cardiotoxicity of tyrosine kinase inhibitors12. Finally, we normally wait 22–28 days in culture before measuring drug effects: in our experience with impedance recordings of the same cells, a steady-state for slow impedance (an indicator of cell layer stability) and fast impedance (an indicator of beating frequency) is reached after 12–15 days in culture. However, we decided to wait 22–28 days, because this is the time when the expression profile of cardiac channels and maturation markers has stabilized13. It was not examined whether comparable results would be obtained if the cells were used earlier or later. The protocol described here uses a very straightforward measurement of the spontaneous beating rate of hiPSC-CM to evaluate potential drug effects on human cardiac electrophysiology. Its main advantages over other methodologies are that i) it is amenable to a high-throughput screening environment, ii) it records the activity of the cardiomyocytes and the effects of drugs at physiological temperatures, and iii) it does not require electrophysiological expertise for the execution or for an assessment of results. In a validation study performed with many drugs approved for human use, we showed that the assay reacts to drugs used in human medicine as predicted by existing clinical data5. Because this method considers all potential effects on cardiac rhythm, it complements the Comprehensive in vitro Proarrhythmic assay (CiPA) initiative14 that specifically assesses pro-arrhythmic potential. In the future, this method could provide a further understanding of the mode-of-action of drugs shown to affect the spontaneous beating rate. It is likely that additional mechanistic information is present in the fluorescence recordings of Ca transients (e.g., in their amplitude or shape). If the fluorescence recordings are performed at higher acquisition rates (e.g., 30 Hz), these parameters are easily extracted in addition to beating rate, and it may be interesting to correlate changes in these parameters with the known effects of clinically used drugs. Guo, L. Estimating the risk of drug-induced proarrhythmia using human induced pluripotent stem cell-derived cardiomyocytes. Toxicological Sciences. 123, 281-289 (2011). Jonsson, M. K., Wang, Q. D., Becker, B. Impedance-based detection of beating rhythm and proarrhythmic effects of compounds on stem cell-derived cardiomyocytes. Assay and Drug Development Technologies. 9, 589-599 (2011). Kattman, S. J., Koonce, C. H., Swanson, B. J., Anson, B. D. Stem cells and their derivatives: a renaissance in cardiovascular translational research. Journal of Cardiovascular Translational Research. 4, (1), 66-72 (2011). Ma, J. High purity human-induced pluripotent stem cell-derived cardiomyocytes: electrophysiological properties of action potentials and ionic currents. American Journal of Physiology Heart and Circulatory Physiology. 301, (5), H2006-H2017 (2011). Sube, R., Ertel, E. A. Cardiomyocytes Derived from Human Induced Pluripotent Stem Cells: An In-Vitro Model to Predict Cardiac Effects of Drugs. Journal of Biomedical Science and Engineering. 10, (11), 23 (2017). Sirenko, O. Multiparameter in vitro assessment of compound effects on cardiomyocyte physiology using iPSC cells. Journal of Biomolecular Screening. 18, 39-53 (2013). VanderPlas, J. T. Understanding the Lomb-Scargle Periodogram. Cornell Univeristy Library. arXiv:1703.09824 (2017). Strober, W. Trypan Blue Exclusion Test of Cell Viability. Current Protocols in Immunology. 111, A3 B 1-3 (2015). Ertel, E. A., Godfraind, T. Calcium channel blockers and calcium channels. Calcium Channel Blockers. Godfraind, T. Springer. Basel, Switzerland. 11-80 (2004). Sanguinetti, M. C. Modulation of potassium channels by antiarrhythmic and antihypertensive drugs. Hypertension. 19, 228-236 (1992). Duran-Riveroll, L. M., Cembella, A. D. Guanidinium Toxins and Their Interactions with Voltage-Gated Sodium Ion Channels. Marine Drugs. 15, (10), (2017). Sharma, A. High-throughput screening of tyrosine kinase inhibitor cardiotoxicity with human induced pluripotent stem cells. Science Translational Medicine. 9, (377), (2017). Puppala, D. Comparative gene expression profiling in human-induced pluripotent stem cell--derived cardiocytes and human and cynomolgus heart tissue. Toxicological Sciences. 131, (1), 292-301 (2013). CIPA. Available from: http://cipaproject.org (2016).